Last week, thousands of security researchers, professionals and hackers attended Black Hat USA, one of the world’s largest hacking conventions, in blistering hot Las Vegas. Many of them stuck around for a few more days to continue their hacking at DEF CON. Between the two conferences, attendees hacked one another, attacked Amazon Web Services, and picked locks, but thankfully they did not hack the Mandalay Bay air conditioning system. In it’s 18th year, Black Hat USA feels more than ever like a corporate trade show, unlike its subversive older sibling, DEF CON. Black Hat featured a mix of established security vendors and emerging startups as well as Fortune 500 companies trying to recruit cybersecurity talent. Several Black Hat sessions made national news headlines; Black Hat presenters revealed how to hack a Jeep, how to hack a smart rifle, and how to exploit Android simply by sending a malicious MMS message. In addition, several talks at Black Hat demonstrated how hackers can use encryption to evade detection, such as sessions about ransomware and man-in-the-cloud attacks. Attendees watched demonstrations of DDoS attacks at our DDoS security pavilion. 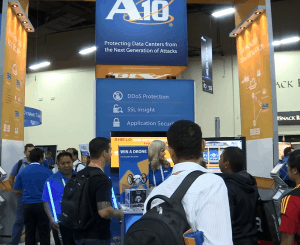 We also showcased the integration between A10 Thunder ADC and several A10 Security Alliance partners, revealing how A10’s SSL Insight technology can decrypt SSL traffic and forward network traffic in clear text to third-party products for analysis. Multiple A10 Security Alliance partners presented in the A10 Thunder Theater to packed audiences! Our partners discussed growing security threats such as SSL security blind spots, DDoS attacks, and advanced malware. Partners included RSA, Cyphort, Ixia, Pulse Secure, ThreatSTOP, Vectra Networks, and Venafi. After each of the presentations, we had the opportunity to interview our partners. You can check out all of the partner videos on the A10 YouTube channel. Black Hat USA 2015 was a great success for A10! We hope to see you at VMworld (booth #2140) in San Francisco later this month.